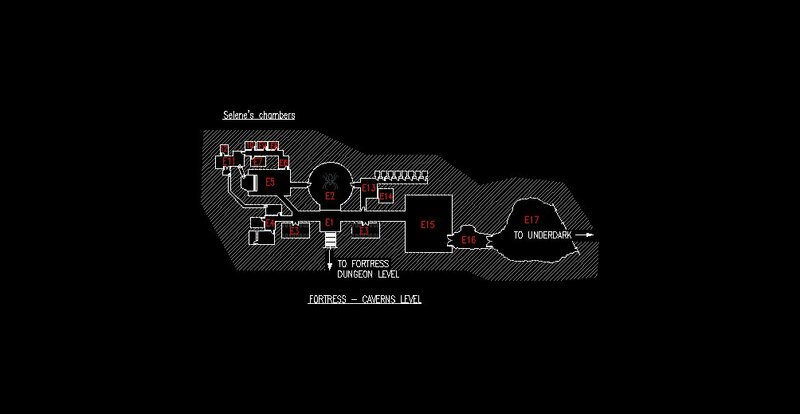 GENERAL INFORMATION: This level is completely controlled by Selene and her dark elves (Bodok's tunnels are completely separate and do not connect to the main caverns.) The entire area is cleanly-hewn from the rock, with decorations, fancy torch sconces, fine-wrought iron doors, and so on. Hallways are 10' high and arched. Every denizen of this level is an intelligent, dangerous adversary; none will waste the time to ask intruders stupid questions, choosing to attack swiftly and with extreme prejudice. Except where noted as having even more powerful armament, all of these individuals are outfitted with the typical drow chain mail, bucklers, maces, daggers, hand crossbows, etc; all of Selene's retinue have at least +2 equipment of this sort. All of these dark elves also possess the magic resistance, spell-like abilities, etc common to their kind. This is a very dangerous bunch. e1. Entry hall Stairs from the Dungeon level open into here. e2. Spider's room This huge chamber is a web-filled hemisphere of 60' radius. It is also the lair of quite possibly the largest spider ever to walk this world: monstrous spider, ac 2, HD 14, hp 111, thac0 7, #att 1, damage 3-18, sa poison w/save@-4 or coma for 2-5 hours, sd regenerates 3 hp/round, mv 9" (Wb 12"), size G (30' across.) This beast is one of Selene's most powerful servants, some think (correctly) a boon granted by the dark goddess Lolth. The spider will attack anyone - even dark elves - who enters this area without Selene being present. A massive portcullis blocks this area from the entry hall e1; a wheel to the east of the gate, on the hall side, will work a series of winches to raise it. The raising of the bars would enable the spider to roam much of this level freely. Scattered amidst the floor-to-ceiling webs here, almost certainly impossible to find without magic and then fire, are 16 gemstones (9x500, 4x1000, 3x5000 gp value), a book of exalted deeds, and a mace of disruption. The latter two items can be found next to the ancient skeleton of the priest who brought them in here before perishing. e4. Consort's suite These chambers are the living area of Selene's consort, Thalzabaal, and his bodyguards. Selene's consort is one of the finest warriors that the drow world has ever produced. A perfect mix of strength, speed, and durability, his skills have served him well and enabled him to survive in the Underdark. He is actually a very quiet, calm individual - a trait which sometimes irks Selene. Thalzabaal knows that he plays a most dangerous game, and he is perpetually on his guard. The consort fights with a shortsword +2 of quickness and a dagger +3. Both are usually poisoned, a quite potent venom (-4 on saves) which he has developed on his own and is immune to. He also carries a hand crossbow +3, of accuracy, whose bolts are poisoned as well. Thalzabaal wears drow chain mail +4, a cloak of protection +3, boots of speed, and a ring of regeneration. Between his items and his natural speed, he boasts an ac of -8, which mirrors his offensive tactics: fast, precise movements. He has been known to deal a killing blow before a foe ever begun its attack. Thalzabaal also carries several useful potions (extra-healing, flying, gaseous form) in nearly-indestructible steel vials. e6. Entry to priestess' quarters This chamber contains a stone golem (hp 60) of pure obsidian, whose head is carved to resemble that of a spider. e7. Fionael's quarters This dark elven mage is, along with Thalzabaal and Selene, the key to the drow power here. This short, slender dark elven woman's appearance belies her fearsome magical prowess. She serves Lolth without question, and thus serves Selene. Fionael is calculating and impersonal in her actions and decisions. Fionael does not engage in physical combat, but her spells and her ring of telekinesis have never failed to keep enemies at bay. She wears a light, ornate pair of mithril bracers of defense, ac2 and a cloak of protection +3. She also carries a rod of terror and an iron bands of Bilarro. e8. Priestess' quarters This chamber quarters two female drow (P9 P8.) They have armor, weapons, etc as noted for the residents of area e3. e11. Selene's chambers This large, oddly-shaped area is home to the drow priestess-queen Selene. Everything in here is sinister, even for furniture: an elegant poster bed whose supports resemble jointed legs, a mirror whose metal frame resembles the body of a spider, and so on. There are a number of drow- and Lolth-specific items here, such as artwork, sacraments, candles, incense, and such. Spiders are an integral part of Selene's life, and thus there are 13 of them in here: giant black widows (13), ac 5, HD 3, hp 20 each, #att 1, dam 2-8 + poison (save at -3 or die), size S (1' across.) Although the high priestess carries her primary magical items, there are a few others kept here, along with some monetary treasure. A bowl fashioned from the skull of a mind flayer contains 17 emeralds worth 1000 gp each. Beneath the bed is a chest containing 40 small ingots of pure platinum worth 100 pp (500 gp) each. A small room to the south contains a heavy wardrobe of black wood; among the garments within are a robe of eyes and a cloak of the bat. Behind this piece of furniture are a secret door and passage to area e4. Five feet beneath the stone floor, buried in a cask of thick lead, is a treasure both great and terrible, depending who you ask. The item is an ancient sword forged by the elves: G'rth Tel'gothrim (commonly known as Drowslayer), a finely-crafted mithril-steel longsword +3, +5 vs drow, detects drow within one mile, can cast continual light 7/day, no darkness can exist within 5' of it, special purpose is to slay drow, special purpose power: spell turning if brandished, against any spell or power originating from a drow. e12. Bathchamber This is an elaborate washroom, with a huge ivory tub and magical sources of water. In addition to containing a number of Selene's very personal effects, it contains a trap operated by a level within easy reach of one in the tub: a rack of seven razor-sharp blades swings down from the ceiling, slicing anyone in the 10'x10'x10' area inside the door for 7d12 damage. e13. Cell block This area has eight cells. The third and fourth each contain two prisoners (0th level humans, captured in a recent raid on a caravan) while the fifth contains a dead prisoner from the same group. The eighth cell contains a weakened drider (11/32 hp) who is trying to gain favor with his captors and will make up any lie to rescuers until he gets a chance to turn the tables on them. e14. Storage This area contains packaged/preserved foodstuffs, wine, clothing, and other supplies, much of it in small casks and large crates. e15. Antechamber This huge chamber serves two purposes: it's a guardroom against intrusion from area e17 and it's a storage area for a force of animated statues which Selene created and controls. The statues are very lifelike, fashioned in the form of drow, which may surprise foes who initially treat them as such. In reality, each statue is a potent fighting machine. Animated statues (11), ac 0, HD 7, hp 40 each, thac0 13, #att 2, dam 2x 1-8/1-12 +3, SD half damage from edged weapons, size M. These guardians will not leave this chamber unless directed to do so by Selene, Thalzabaal, or Fionael. e16. Antechamber cavern This cavern is sealed at each end by a large pair of thick iron doors. Both are kept locked and barred from the inside. A total of 16 shriekers (hp 20 each) live here, providing an effective warning system against intrusion from area E17. Selene uses a special unique spell to keep them quiet on those occasions when she ventures out into the Underdark. Near the southern wall are a number of packs, harnesses, reins, and so forth. Two wagons of black wood, one large and one small, also rest here. Selene has an active trading business going with her contacts beneath the world's surface, and barters goods from above for goods from below. She typically uses either giant spiders or drider to pull her wagons on such expeditions. e17. Entry to Underdark This huge cavern is actually just the terminus of a branched passage within the Underdark. The existence of this portal was a deciding factor in the fortress' location, and Selene makes occasional trips into the Underdark for recruiting or other purposes. In addition to being wizard locked and bearing a symbol of fear, the double doors leading from area e16 to here have a spell of alerting placed upon them. If they are opened without her consent, Selene will know. A word about Bodok and his tunnels This complex, twisting series of passages would be challenging to map even with a three-dimensional mapping tool. Basically, it's a maze with many vertical tunnels as well, all of them ranging from 10-20' wide. Aside from Bodok himself, there are at least one each of the following (hp, treasure can be determined randomly) : death kiss, eye of the deep, spectator, beholder mage, orbus, doomsphere, astereater, gorbel.